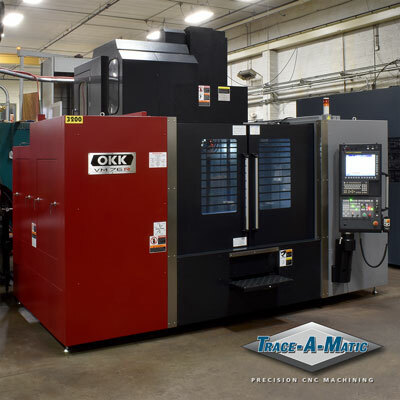 In striving to be the global manufacturing supplier of precision machined components, Trace-A-Matic North has purchased and installed a new OKK VM76R vertical machining center to replace an aging Mori Seki MV65. The OKK VM76R will have a Troyke full fourth axis rotary table along with a 12,000 RPM spindle, Renishaw probe, and coolant through the spindle. This machine will be used universally to meet the demands of the Defense, Oil & Gas, Heavy Equipment, Food, and Medical markets.